To better understand the problem of the needs of these organizations, let’s look at a few of the most common. The first case to look at is when there are several development groups that are mostly independent. This is shown in the following figure. This structure is relatively easy to manage. 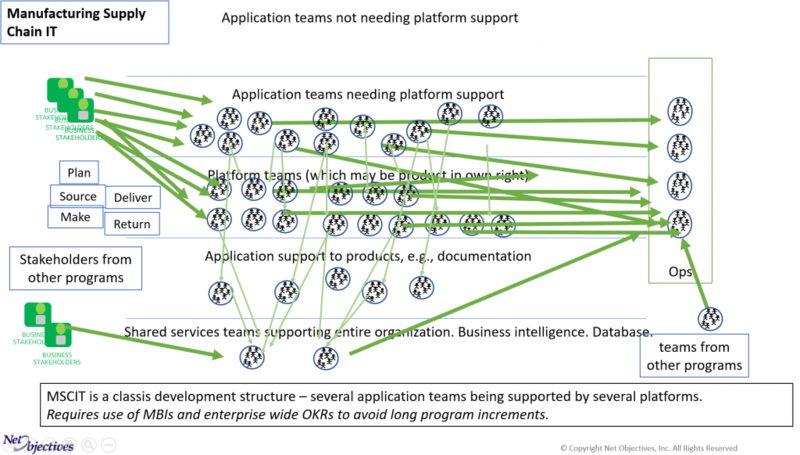 This is a common structure for development organizations for less than 75 people. 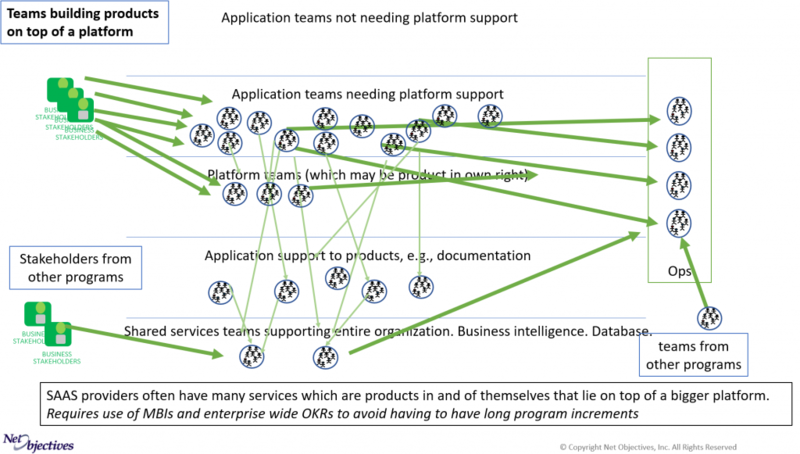 After that almost all organizations require some support group as shown in Figure 2. Independent development groups are easy to manage and can be planned on a per sprint basis. Big room planning is not needed, but often good for its social aspects. Also, because of the size of the organization it is often affordable. For most organizations over 50 or so people in the development group, figure 2 is more common. This requires a bit more planning or the use of Kanban. Kanban at the application support to products can usually manage how to handle dependencies. 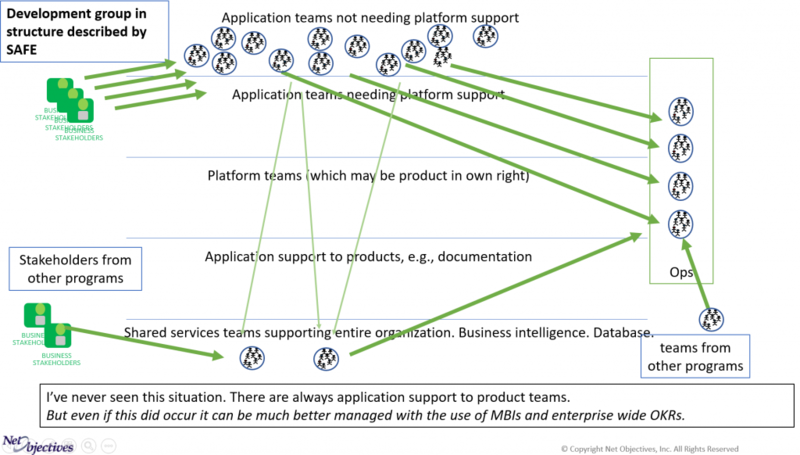 But in order for this to work, MBIs must be used to sequence the work being requested so that the support teams know which are the most important to get done. Another practice to improve flow is to temporarily assign people from the application support teams to the teams that need them. As the cloud becomes more popular we’re seeing more and more often that applications share a common platform which may be a product in and of itself. 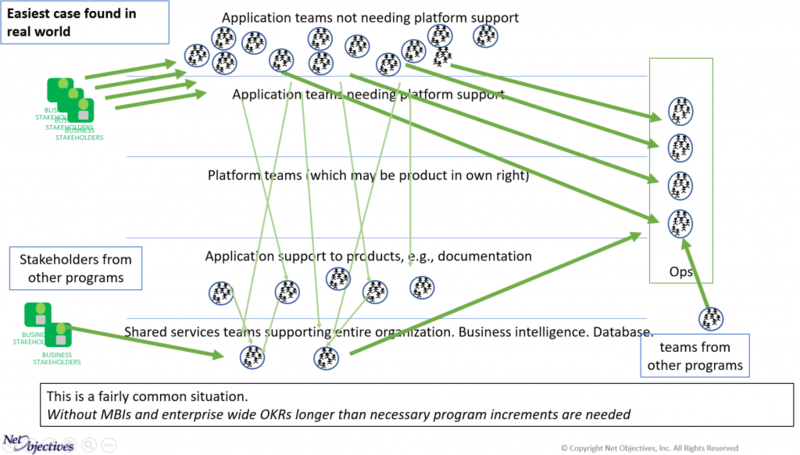 Many companies have the challenge of multiple horizontal platforms that are products in their own right supporting multiple vertical applications that require them. A common example is Manufacturing Supply Chain IT. Seeing how to manage flow can be accomplished through the A Simple Guide to See if a Change Will Be an Improvement later in this book.